Chef Billie DeNunzio’s culinary arts students stepped to the front of the class during Souper Fun Sunday at Saint Francis High. They went head-to-head with the best chefs in the Gainesville area, but the kids from Eastside High School’s Institute of Culinary Arts won the judges’ hearts—and tummies—during the 9th annual Souper Fun Sunday at Saint Francis Catholic Academy. 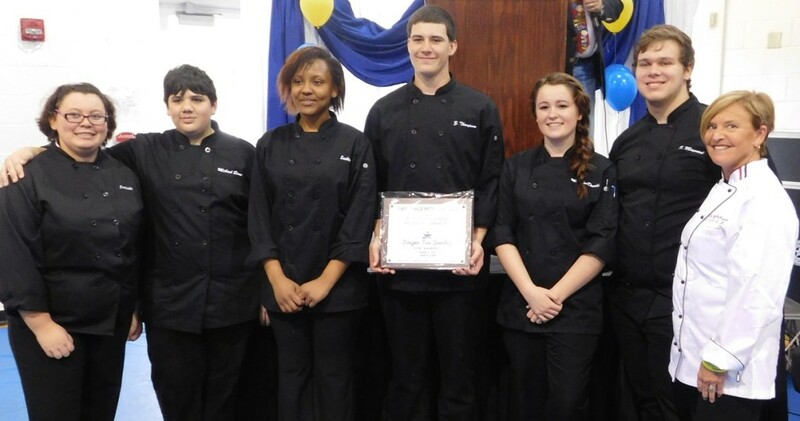 The Loaded Bacon Potato Soup created by students in Chef Billie DeNunzio’s culinary class earned first place in the non-seafood category in voting by a panel of six judges. The Eastside team was one of 29 restaurants and/or catering businesses participating in the annual fundraiser for the school. There were 37 varieties of soup offered for tasting, 26 in the non-seafood category won by the EHS team. About 800 people attended the event. None went home hungry. 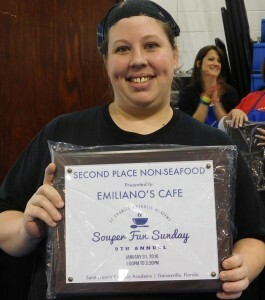 Chef Shanti Riesch and her second-place award for Emiliano’s Cafe’s Pork Chili Verde. Emiliano’s Café and Chef Shanti Riesch was the only downtown restaurant to win a judges’ prize, taking second place in the non-seafood category with a mouth-watering Pork Chili Verde. Chef Shanti pointed out that the concoction was gluten-free, dairy-free, seafood-free and nut-free. In the seafood category, judges chose The Swamp restaurant’s Shrimp and Crab Bisque the best ahead of Embers Wood Grill and its famed Gulf of Mexico Blue Crab Bisque, which has won in previous years. Judges also awarded The Swamp first place in the vegetarian category for its savory Summer Squash and Corn Chowder. Second place was a tie between Pomodoro Café’s Velvet Artichoke Soup and B.J.’s Brewhouse’s Tomato Bisque. Five of the guest judges for Souper Fun Sunday. 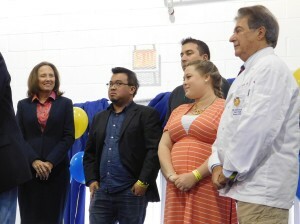 The guest judges were Rose Fagler, Ken Peng, Nick DeConna, Chef Michel Maloiseau, Margot Wilder and Linda Fuchs. Meanwhile, those who attended the event also had a chance to vote. The People’s Choice awards went to Newberry High School’s Culinary Creations (non-seafood), Embers Wood Grill (seafood) and the Great Outdoors (table decoration). The NHS team, led by instructor Fred Schwarz, served up a Grilled Chicken Alfredo with Pesto Garnish. Gainesville’s downtown restaurant scene was represented at Souper Fun Sunday by Emiliano’s, Harry’s Seafood Bar & Grille, Jolie Catering & Events (Andaz), Sweetwater Branch Inn, The Sweet Tea Restaurant, Sweet Mel’s and Café C.
The highlight of the afternoon was the win by Eastside High’s Institute of Culinary Arts, which DeNunzio has spearheaded for 20 years. She said the Loaded Bacon Potato Soup that won on Sunday was the result of trial and error. DeNunzio credited senior Stephen Maynard and junior Zach Thompson, both in their first year in the program, for developing the final, award-winning recipe. EHS student Megan MacDonald said that DeNunzio is an excellent instructor and chef. Maynard and Thompson are also EHS athletes who couldn’t resist using sports analogies to describe winning the Souper Fun Sunday’s top prize. “I play baseball and I’d have to say this is a home run,” Thompson said. “I play football, so I’d say this was a touchdown,” Maynard said. To view more photos from Souper Fun Sunday, please visit Gainesville Downtown on Facebook.